The LG PZ750 is a plasma-screen 3D TV, but you only get one pair of pricey specs. LG has announced that its range of 'Cinema 3D' TVs will arrive in UK stores from next week. The LW450U, LW550T and LW650T TVs, which were first revealed at this year's CES in Las Veas, are LG's first ever LED Cinema 3D screens. According to LG, the televisions offer 'flicker-free 3D' akin to that of the cinema, and are available in screen sizes from 32- to 55-inches. Offering passive 3D, each of these LED 3D TVs will come with seven pairs of glasses (seems a rather odd number to us) but extra pairs are also available – prices start at £2 and there's no need for any pesky batteries. Something that will require batteries, though, is the LG magic motion remote, which should make it nice and easy to control all the extra connected features included in LG's Smart TV platform. This is the internet-connected side of the TVs, offering apps, online video services and access to social networking sites like Facebook and Twitter. 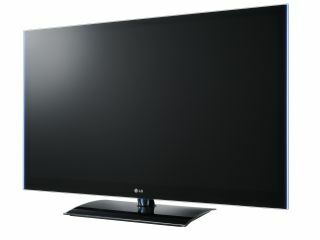 Also going on sale next week are two Plasma 3D TVs, the PZ570T and PZ950T. With active 3D, you only get one pair of specs with these models, but they do come with all the connected bells and whistles.